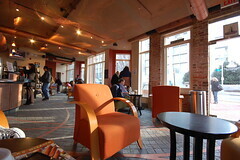 One of the reasons I’m here in DC at the minute is to check out a coffee house called Ebenezers. Ebenezers is a coffehouse owned and operated by National Community Church here in DC, and sits in prime location just round the corner from Union Station. NCC view Ebz as a way to build relationships with the community around them, and it enables them to funnel any profits back into community outreach programs. At my church (GWV) we have been talking about the possibility of doing something similar. We want to be able to run a top class coffeehouse that would become a home-from-home, a hub for local creativity, and a way of giving back to the community. So, I’m here spending several hours a day hanging out at Ebz, talking to lots of staff, watching how it all works, learning as much as I can. Doesn’t hurt that the coffee’s great to boot…! Ebenezers is quite possibly the best coffeeshop around – a modern day well to hang around at 🙂 Great photo, Emma! @ ally: indeed, reading everything must change. havent found it too difficult, nothing majorly new for me in terms of social justice stuff but seems like (so far) a pretty good introduction for people who don’t know much and would like a quick overview. came across one bit that stumped me a bit (controversial mclaren as ever…) so i dunno. you read it? Emma, thanks for the great photograph of Ebenezers! I really dig it. God bless you in your travels. hey there…just wandered over from daley’s blog. i played a show here at ebenezer’s a couple months back…they definitely have a cool performance space downstairs. i hope you’re enjoying your time here in the DC area. how much longer are you here? hey julie, thats cool, i like the downstairs space. saw a jazz trio play there when i was here in august. i’m heading to chicago early tomorrow morning for a week, but will be back in DC the 5th-10th Mar. you here then, we should connect?